Miranda Shurer (AE ’02) knows it takes a village, and she’s proud to be a part of hers—the vast, global Illinois Tech alumni network that shares stories about Illinois Tech with prospective students. 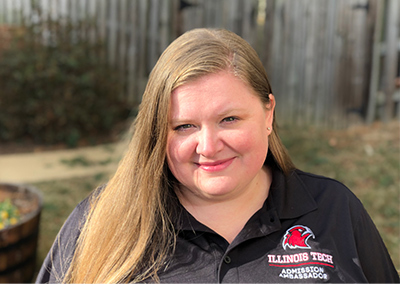 Shurer volunteers her time as an Admission Ambassador, attending college fairs and events near her Washington, D.C., home, spreading the word about Illinois Tech. After she graduated Shurer enjoyed the higher-education world so much that she made a career of it, earning her M.Ed. in counseling psychology and working in residence life at the University of North Carolina Charlotte. She has since taken on the role of stay-at-home-mom to raise her two sons and instills in them the importance of higher education. Attend any number of admission events throughout the year, as many or as few as possible. Refer prospective students to Illinois Tech. Communicate with admitted students through phone calls, letters, and emails. Attend regional college fairs and visit high schools in your area. To learn more about becoming an Admission Ambassador in your area, visit https://admissions.iit.edu/undergraduate/alumni.